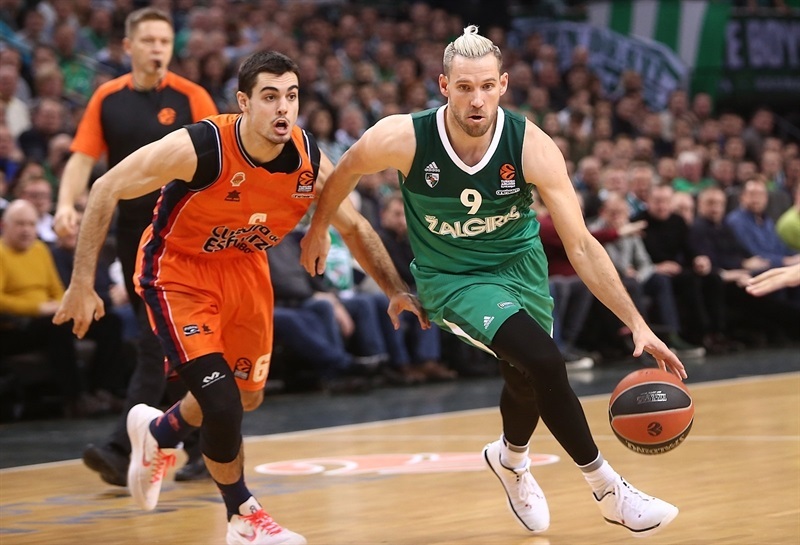 Zalgiris Kaunas held off a comeback attempt from visiting Valencia Basket to hang onto a valuable 86-82 win on Thursday. 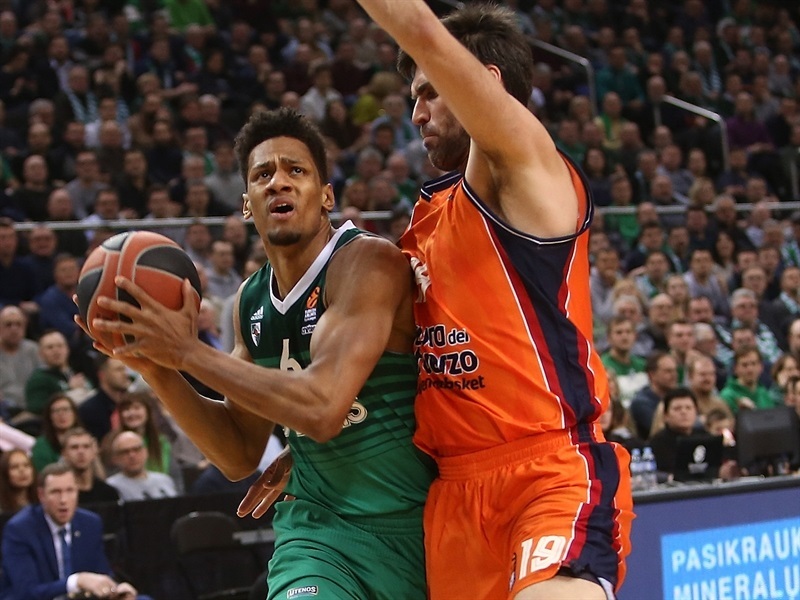 Zalgiris improved to 12-7 on the season, while Valencia dropped to 6-13. 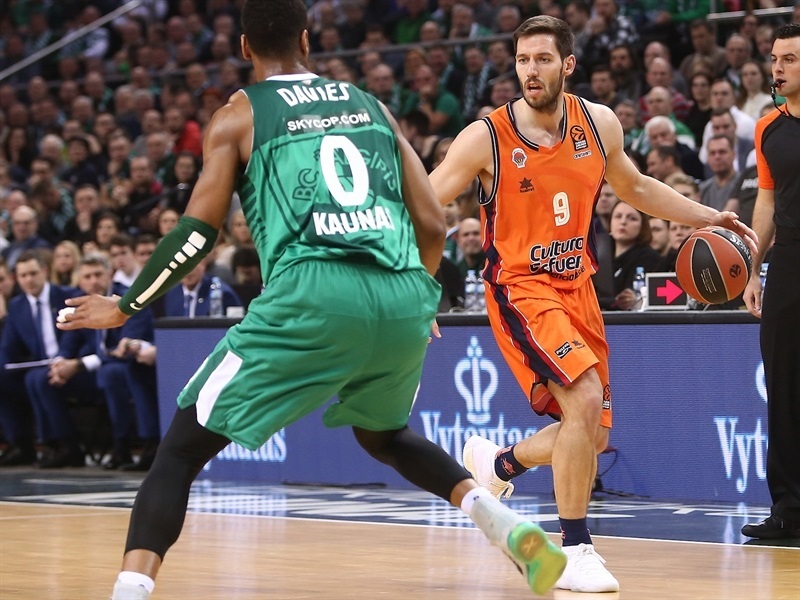 Zalgiris had a dream opening to the game with Kevin Pangos running the show, and led by 16 at halftime, but Erick Green and Tibor Pleiss rallied Valencia. 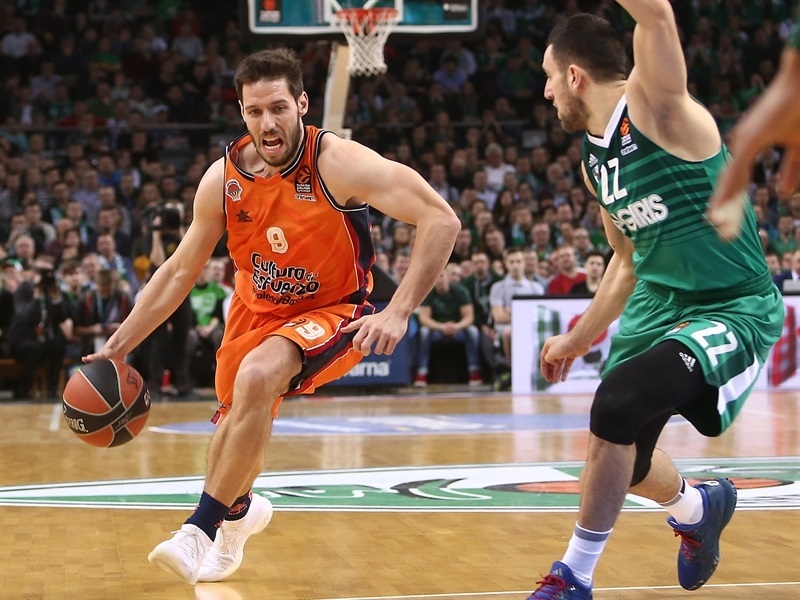 The visitors took their first lead with 5 minutes to go in the fourth quarter, but Zalgiris made more plays as the game went down to the wire and pulled out another win. 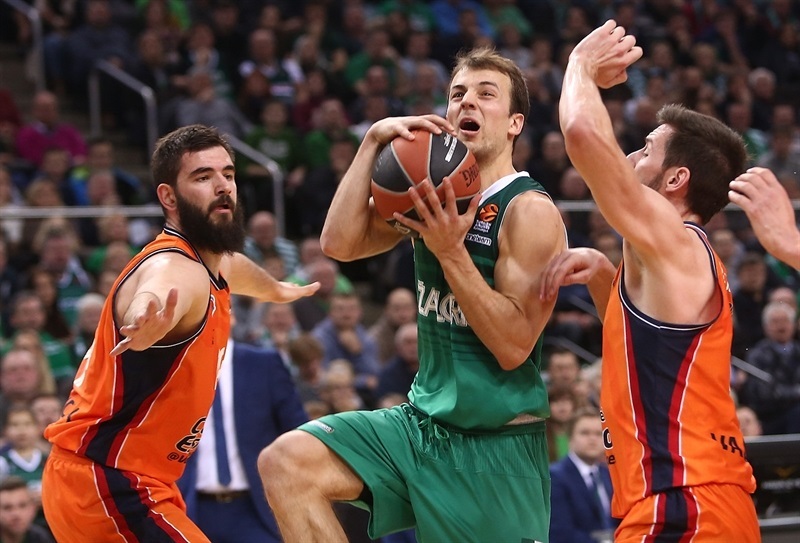 Pangos dished 10 assists in the first 16 minutes, and finished with 15 total – the most in the EuroLeague this season – to go with 11 points. Axel Toupane paced the hosts with 18 points, while Arturas Milaknis netted 12 on 4-for-6 shooting from long range. Aaron White was clutch down the stretch and collected 11 points plus 8 rebounds. Paulius Jankunas also had 11 and Edgaras Ulanovas 10 points in victory. Pleiss scored 20 points and Green 17 for the visitors. 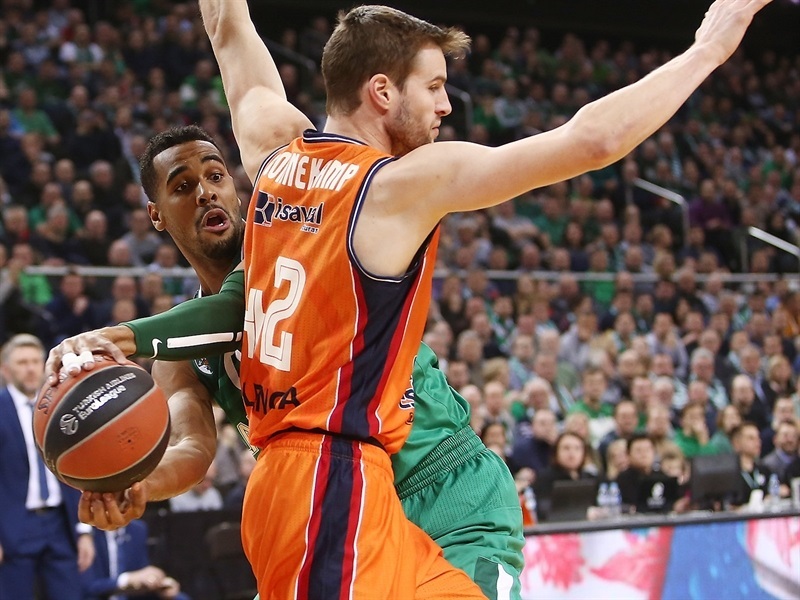 Will Thomas finished with 19, including back-to-back three-pointers that got Valencia close in the final minute, while Sam Van Rossom dished 10 assists in defeat. 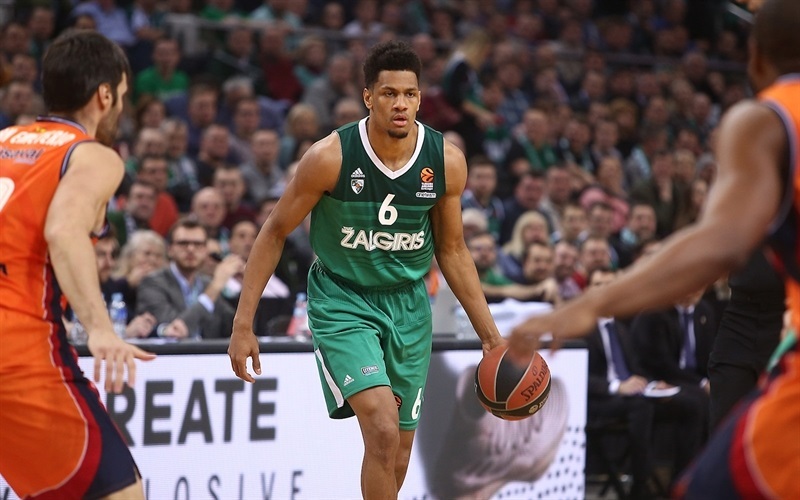 Zalgiris stormed out of the gate. With Pangos running the show, Jankunas hit a three-pointer on the opening possession and Toupane took it twice to the rim as Zalgiris opened the game with a 13-0 run. Valencia did not score on its first eight possessions, before Thomas got the visitors going with 4 minutes gone. Thomas scored twice, while Bojan Dubljevic and Van Rossom added a triple apiece. 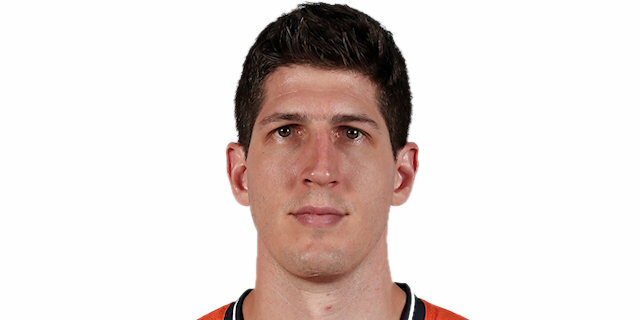 When Pleiss and Green joined in, the latter with a three-pointer as soon as he came off the bench, Valencia was already within 5 points, 24-19. White ended the first quarter with a fastbreak layup before Pangos fed Milaknis for a pair of wide-open triples early in the second quarter, making it 32-21. Pleiss had a three-point play for Valencia, but Pangos fed Jankunas twice and Milaknis for his third three as Zalgiris opened 41-24 lead. 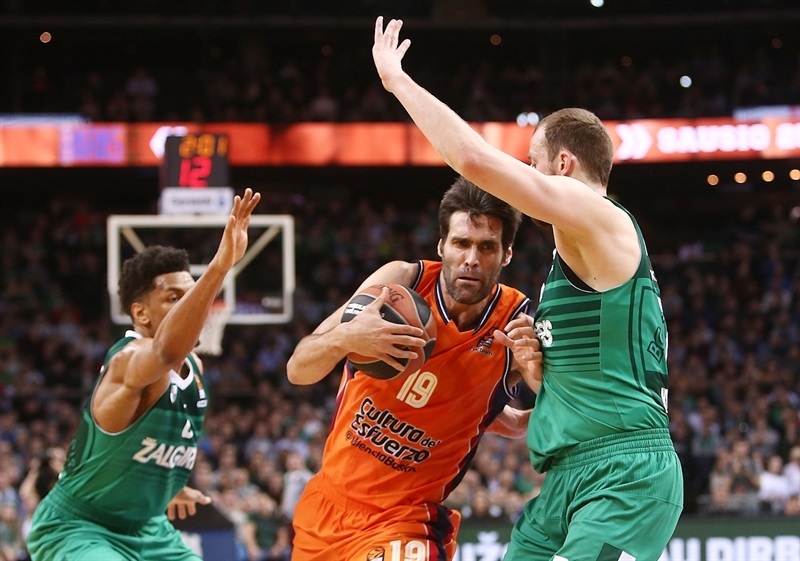 Valencia got a spark from Rafa Martinez and Fernando San Emeterio, but Zalgiris kept its lead safe and went into halftime up 47-31. Thomas had a pair of close range baskets for Valencia that helped the visitors get into a rhythm and cut the difference to 51-38. Toupane remained hot on the other end, hitting a long jumper to extend the margin to 56-40 midway through the third quarter. However, Toupane committed his fourth foul and Brandon Davies already fouled out, so Valencia was not giving up. Green got hot and knocked down 3 three-pointers near the end of the third quarter, making it 63-57 after 30 minutes. Green's second-chance triple opened the fourth quarter before a runner by Pangos snapped a 0-11 Valencia run. 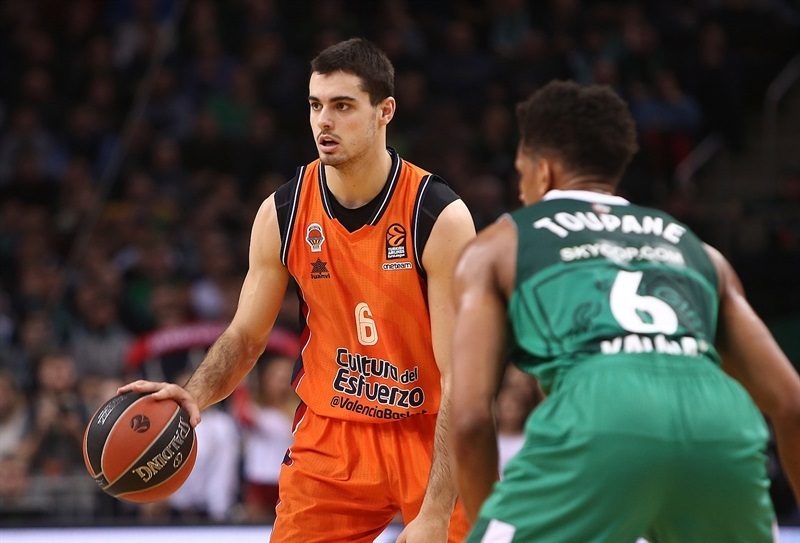 White had a dunk-plus-free throw, but San Emeterio scored 5 points before Pleiss strung together 6 of his own from close range and put Valencia in front 70-71 with 5 minutes to go. 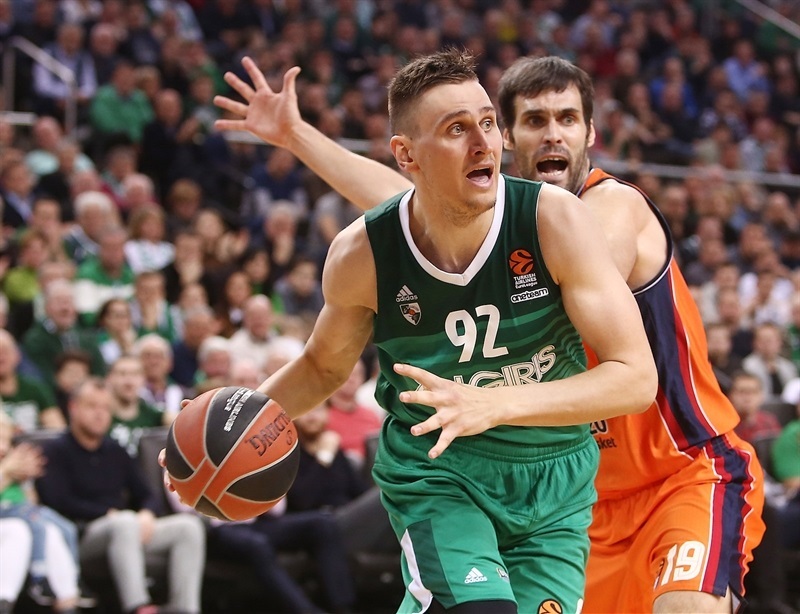 Valencia got Zalgiris off its rhythm with zone defense, but Zalgiris solved it with a jumper from Jankunas and a second-chance triple from Milaknis that made it 79-73. Pleiss answered with a three of his own, but Ulanovas and Antanas Kavaliauskas opened a 83-76 margin. After a timeout with 78 seconds to go, Thomas knocked down a pair of triples to make it 83-82. Valencia made one more defensive stand, and Thomas got another look from long range, but missed. There were still 8 seconds to go and Pangos only split his free throws, but White pulled down an offensive board and Ulanovas sealed the deal with 2 free throws that fell 2.9 seconds before the final buzzer. "I feel great because it is a win. The most important thing is that the team keeps showing character game after game after game. This is our fourth game in seven days, and in all four games everything has gone to the last seconds. Players are pulling stuff out, you have to give them so much credit for such an incredible effort. It is so difficult physically and mentally. 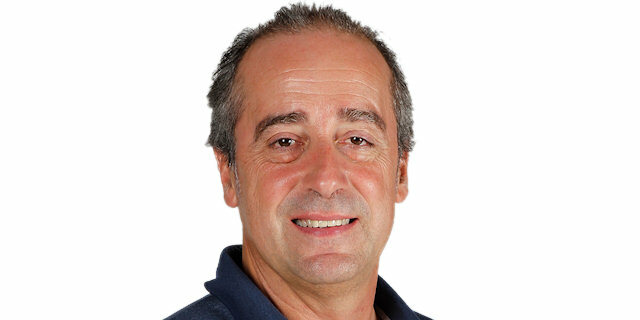 In EuroLeague, for a team like us, every win is great. You really don’t know when the next one will come. We feel great. Axel Toupane set the tone for the game. He and Brandon Davies were great on pressure defense. Then we gave up a little bit on pressure defense, we made a lot of bad fouls. That was our biggest problem. But the players have been incredible the way they pulled the game out, and I am so happy for them and for the fans." "Congrats to Zalgiris for this important win and amazing season. And congratulation to everybody here, because the atmosphere in Zalgirio Arena is very important for everybody who loves basketball. It was a tough game, our start was really bad, and the starting 13-0 difference was the key of the game. But we fought to come back, and we did it, and we even had a chance to win. Our effort was outstanding, but we did not finish the contest with a happy ending. But we are happy for the comeback, and we are aware it is important to start the games better. Zalgiris has great physical players, especially in positions two, three and four. They can have players competing in position five using many different defenses during the game. 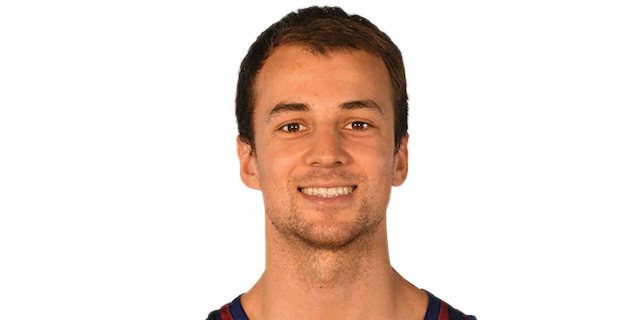 They have a great point guard, Kevin Pangos, who is one of the keys of this team. 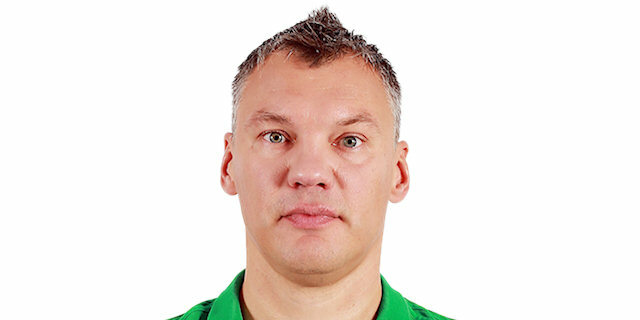 Everyone can see the great chemistry, and there is the great job of Saras Jasikevicius in his third season. " "We got off to a great start. But they are a tough team, they played hard, so they fought back. We made mistakes, but played well overall and the most important thing is the win. [When they came close] we just had to dig in at that time, play even harder, play even smarter. And that is all that it comes down to. We made some big plays down the stretch. They made some shots, but we pulled it out, which is all you need. It is easy [to get assists] when guys are making shots and in that first half we were hitting everything. That makes my job easy; I just try to attack. We have to keep playing well when we are not making shots. At some point in the game we stopped making shots, and we kept playing well. " "Congratulations to Zalgiris on the victory. Unfortunately we opened the game a little bit too slow and with not enough aggressiveness. They took a big advantage, and we had to waste a lot of energy trying to come back, which we were able to do in the fourth quarter. Unfortunately, we missed a little bit of luck to finish the turnaround. This is a tough court to play in; they are very good, they executed really well. All we can do now is learn from this game and move forward."